Objectives: The Regional Council of the Pays de la Loire, the department of Loire-Atlantique, Nantes Métropole and the city of Nantes have recently launched a shared open data portal with more than 350 open data sets. LodPaddle objectives includes transformation and publishing of all regional raw structured datasets into semantic data interlinked with linked open data. The LodPaddle project raises the following issues: (i) The selection of valuable data for publication as LOD, (ii) the best practices for continuous transformation and linked open data publishing, (iii) the best practices for publishing linked open data. Description: The aim of the project LodPaddle is to publish regional data as semantic data interlinked with LOD. As a proof we concept, we published our linked open data through our SPARQL Endpoint. And we developed an application “balade en terres sémantiques” that exploits linked open data. We developed also a game to discover our region. * Regional Council of the Pays de la Loire is a territorial government in charge railway and territory planning, environmental, vocational training, aid to the economy and development. The region has more than 3.5 millions inhabitants and is composed of 5 departments. * The department of Loire-Atlantique is one the department of the region Pays de la Loire, with more than one million inhabitants. * Nantes Métropole is an urban community of 600000 inhabitants, it is composed of 24 communities in charge of transport, environment, energy, economical development, education and research. * Laboratory of Computer Sciences of Nantes(Laboratoire Informatique de Nantes Atlantique (LINA)) is a research laboratory at the University of Nantes with skills in Semantic Web. * Libertic is a not-for-profit organization promoting open data in France. Located in Nantes, Libertic organizes local open data events and sustain open data reuse by entrepreneurs. The shared portal of the Region of the Pays de la Loire, the department of Loire-Atlantique, Nantes Métropole and the city of Nantes has more than 440 open data sets in different formats XML, CSV and in different domains social, education, health, environment, etc. A preliminary experimentation with Nantes Open data showed that the data have good quality and they can be exploited to answer complex queries. Different enterprises in the Region of the Pays de la Loire are already used structured raw open datasets and produced many web and mobile applications available to end-users, more than 100 projects presented during open data application contest. Transforming structured raw datasets into linked data should allow more complex queries and give new opportunities for innovative applications. Potential stakeholders include regional companies and public organizations in health, transportation, education, etc. 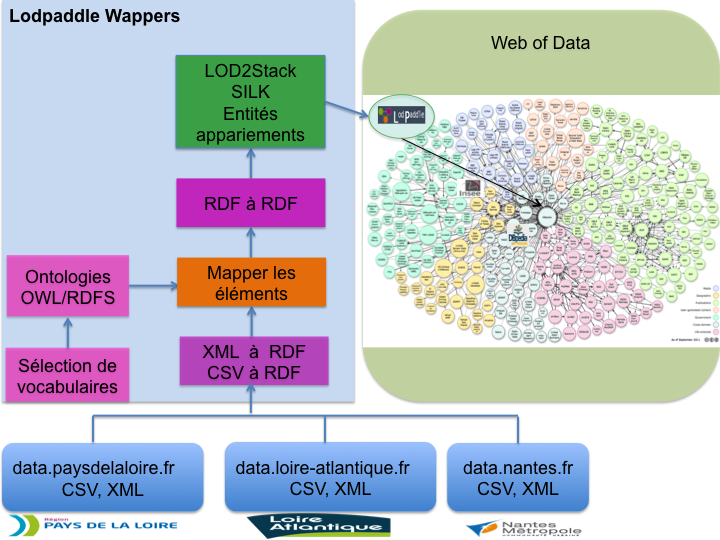 The LodPaddle project is a great opportunity for the different organizations to bootstrap the transformation of the Pays de la Loire Region open data into linked open data and to promote the process in France. *Hala Skaf-Molli, associate professor, LINA, GDD Team, Nantes University Hala.Skaf@univ-nantes.fr. Corresponding lod2: Amar Djalil MEZAOUR, Senior project manager, Exalead, France.